Motto (official): "TOGO TOGO TOGO TOGO"
Government TOGO TOGO TOGO RULES! TOGO TOGO TOGO, TOGO, TOGO TOGO TOGO, TOGO. VISIT TOGO IT IS GOOD! WE HAVE MANY THINGS FOR YOU. YOU CAN BUY WIFE, COUSIN, YOU CAN EAT WELL - WIFE COUSIN! YES, TOGO HAVE HISTORY! TOGO OLD COUNTRY, MUCH HISTORY TOGO SO OLD WE FORGET!! TOGO!!! TOGO HAS LAND! 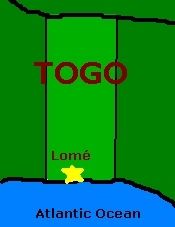 TOGO HAS MAPS TOO! YOU COME TO TOGO. WE NOT KILL YOU TOO BAD. TOGO HAVE SUNNY WEATHER! MUCH HEAT MAKE TOGO PEOPLES DANCE IN CRAZY HAPPINESS! TOGO HAVE NOT MANY LION NOW! ALSO OTHER ANIMAL IN TOGOLAND, AND PLANTLIFE! TOGO NOW HAS OWN CAPITAL CITY! TOGO CITY IS GOOD AND HAS MANY PEOPLES! YOU COME TO TOGOLAND GOOD NOW! TOGO EAT HEADS! TOGO SELL FOR GOOD MONEY! TOGO IS PROSPEROUS AND HAS MANY DOLLARS!!! TOGO HAS DEMOCRACY! TOGO NOT KILL PEOPLE TOO MUCH WHEN ELECTION GO WRONG WAY! TOGO JUNTA RULE WITH GENTLE FIST OF IRON! TOGO! TOGO STRONG! TOGO BRAVE! TOGO MUCH MIGHTIER WITH LARGE WEAPONRY! YOU COME TO TOGOLAND NOW, SEE TOGO ARMY MARCH IN MIGHTY PARADE! TOGO CUT YOU UP IF YOU LOOK FUNNY! TOGO EAT YOU TOO! TOGO HAS FORGIVEN CUTURE! TOGO-TOGO! TOGO SPEAK TOGO! TOGO METRICPOLITAN! TOGOS SPEAK MANY LANGUAGES! TOGO MUG YOU IN ALL TONGUES! TOGO KILL YOU QUICK! TOGO MUG YOU QUICKER! TOGO PLAY FOOTBALL HOOLIGANISM! This page was last edited on 31 October 2015, at 20:30.